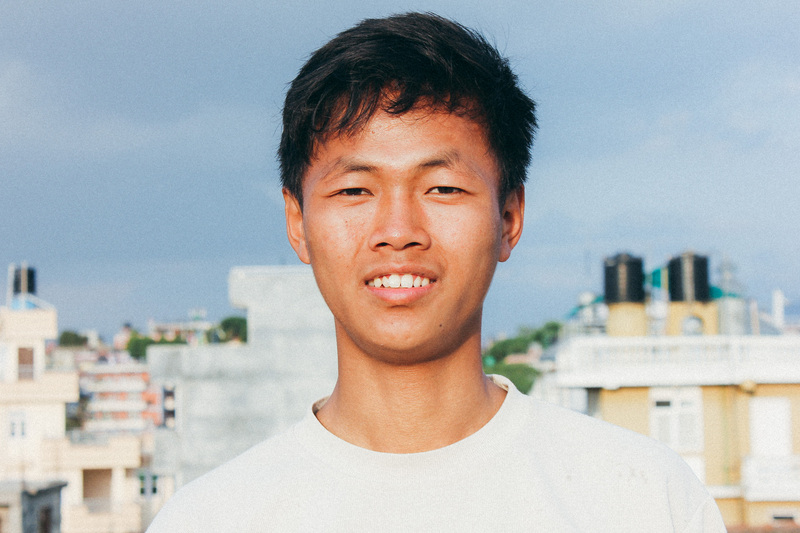 Photo: Our Nepal orphan home graduate, Divsimar. I am Divsimar. I was born on 23rd January, 2000 at Chyamtang village of Sankhuwasabha district. The village is underdeveloped with limited facilities and services. It takes two days to reach there from Kathmandu due to lack of transportation facilities. It was ten years ago when God brought me from my village to Kathmandu at the age of 7 years. I have two elder brothers and a father with a sister. My mother died when I was 5 years old due to illness. There was no hospital or health post in my village. I can hardly remember her face now. My village was underdeveloped and most of the villages were uneducated. Due to the death of my mother, we had to go through many troubles and hardships. It was impossible for my father to handle us. So my younger sister died in front of us and in his lap. Those days were really hard for us. However, he worked very hard to feed us. He worked for others and so we had to wait for daily meals and living. I was forced to rear others’ animals and work for them at the age of six thinking that it might be a little help for my father. There was not a single thought of going to school due to our poverty. Then God brought me to Kathmandu — when I came to the orphan home. I was unknown of everything. I didn’t have good manners and behavior. I got admitted to Covenant Academy school, to attend a school for the first time in my life. In the beginning, it was really difficult for me because I had never gone to school before. So I failed and thought there was no hope for improvement. But there was hope in Jesus and nothing was impossible for Him. So I started to pray a lot, read the Bible, and grew strong spiritually. I got a new spiritual father, mother, brothers, and sisters in my life. They all kept praying for me and never lost hope. God heard our prayers and gradual improvement in my studies could be seen. After that I got 1st, 2nd, and 3rd positions in all of my classes. I got a double promotion in grades 2 and 5 by the grace of God. Finally, I got an A+ grade that proved that nothing is impossible for God. Also, it was the result of our prayers for 10 years until now. Besides studying, there are many other spiritual gifts that I got in the orphan home. The greatest thing that I ever got was Jesus Christ. I also got the opportunity to learn music in my school life. I am blessed that I could learn musical instruments like guitar, the keyboard, and bass guitar. I went to a music school for 2 years to learn bass guitar. Sometimes I think that if God hadn’t brought me away from my village, I cannot imagine what I would be or where I would be. So I always thank God for bringing me here and for all the love and care that I am enjoying. I am always thankful to God for giving me the best father, mother, brothers, and sisters. I am really blessed to be here and live in a good family. Now I am grown up and cannot be under the protection of my parents forever. So I must stand on my own feet and learn to live on my own. I am staying in a hostel away from my parents. It is up to me whether I want to walk through a narrow road or a wide road. I am still struggling to move forward in life and be someone. I cannot and should not forget the hardship and difficulties that I faced during my childhood. I want to do something in my future. I want to develop my village and help the children who really want to study and move forward in life. I will study hard and serve God and poor people to help them economically and financially. I am thankful to God that I am able to study science in my higher classes because it is what I’ve wanted to study since my childhood. It is my ultimate goal to serve God and poor people. To achieve it, I must work really hard with prayer. Lastly, the girls in our ‘She Has Hope’ rehabilitation home harvested 20 pounds of onions and 15 pounds of garlic from their garden in April. Now they are looking forward to a bountiful harvest of eggplant and okra later this month. All of these vegetable will provide healthy staples in the meals for both our girls and the children living in our orphan home. The girls are also learning to make stuffed animals such as elephants, bears, dogs, rabbits, and monkeys. Many of the girls’ crafts are sold online at SheHasHope.org, and all proceeds directly support their rehabilitation. We remain extremely grateful for your generous donations and your faithful prayers, helping to improve the lives of our children, our girls, and our native team. Thank you for making all that we do possible.